I love experimenting with incorporating florals into my projects when I can. 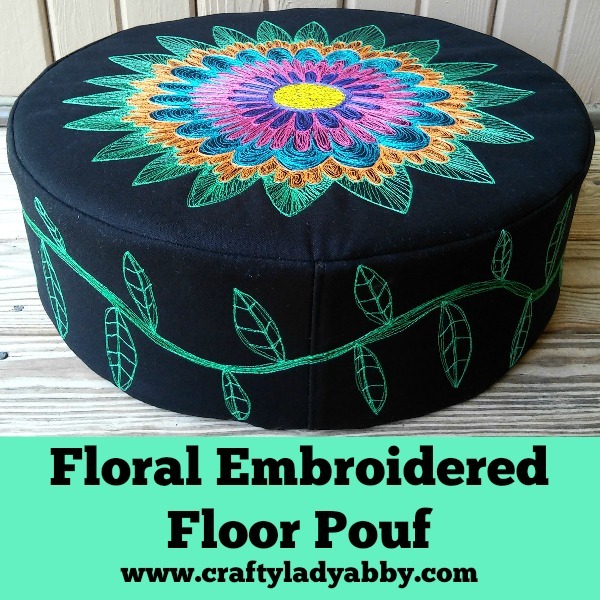 When Fairfield World challenged us Master Makers to create something with their foam tuffet, I immediately thought of those fancy embroidered floor poufs. I could have done this with fabric paint, but that wouldn't be a challenge for me. 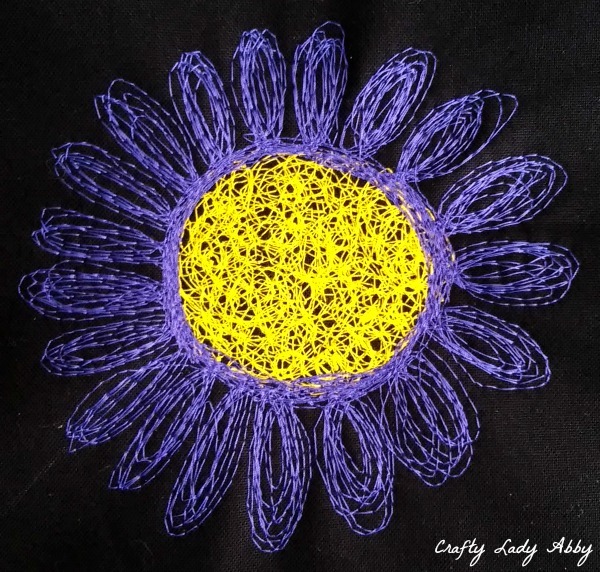 Instead I opted to create a floral motif using free motion embroidery and bright thread. I used black canvas that Robert Kaufman graciously sent me. I could have done this in white or grey, but felt black would show less dirt and have better contrast with the bright colors. CRAFT LEVEL: Intermediate to Expert. You must be an experienced sewing machine user. 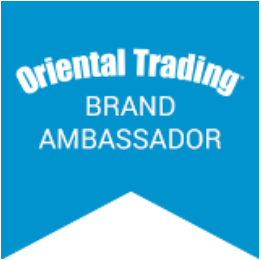 This list includes Amazon Affiliate links. Any purchases made using the Amazon links, will result in Amazon paying me a small commision. 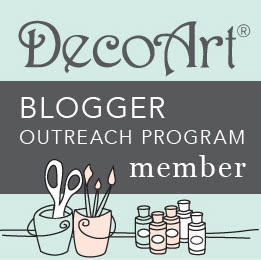 I linked to the exact thread colors I used. Fairfield World and Robert Kaufman provided me with their products to create this project. Fairfield World paid me to create this tutorial. 1) Cut the canvas in half, creating two half yard sections. Set one half aside. Cut the other half in half again, along the fold, creating two large squares. 2) Cut two squares of Smooth interfacing, matching the canvas squares. At the ironing board, turn the iron to cotton. Iron the canvas flat. Lay an interfacing square, glue side up, on the ironing board. Lay a canvas square on top. Iron the canvas slowly, fusing the interfacing to the back. Repeat with the 2nd squares. 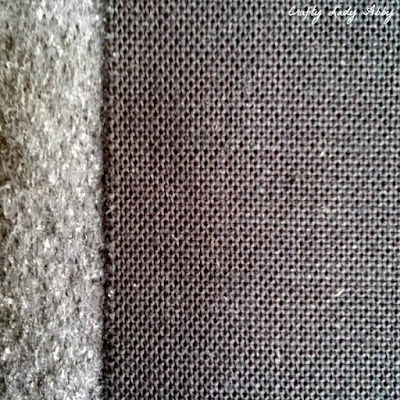 This interfacing helps keep the embroidery from warping the fabric a lot, and gives the fabric more durability. 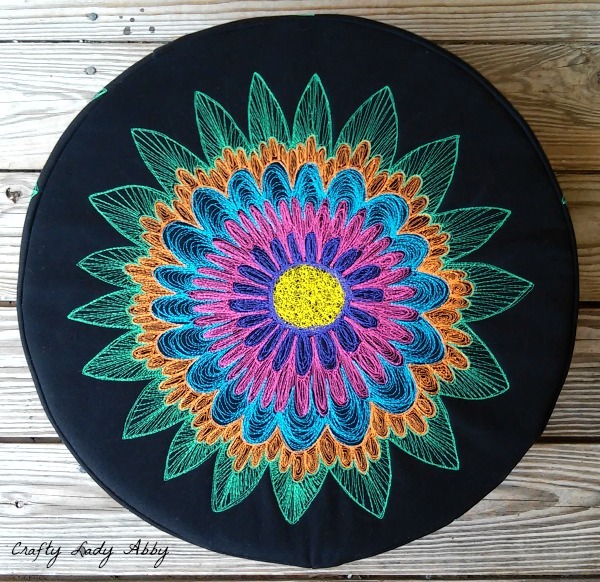 3) Lay the foam tuffet onto a black canvas square. Trace around the tuffet, with the white pencil, for the top piece. Set one square aside, for the bottom. 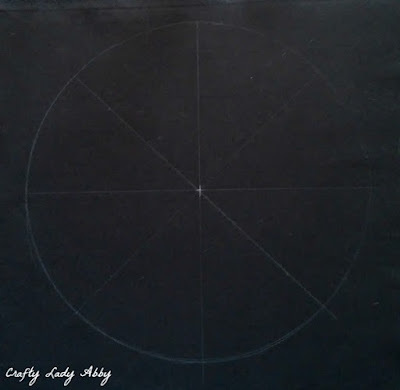 Using the white pencil and clear ruler, segment the circle into 1/8" sections. These are guidelines. 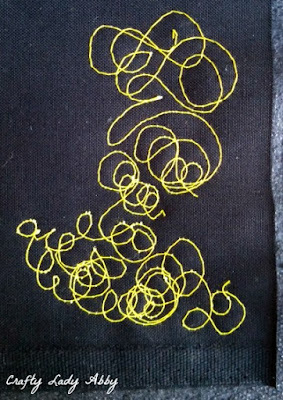 4) Add the free motion embroidery foot and yellow thread to the sewing machine. Lower the feed dogs. 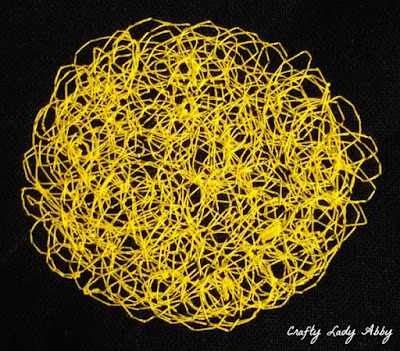 Make some test stitches at the corner of a square, guiding the fabric in swirls. Adjust the tension as needed. The stitches should look normal, despite being curvy. The tension will stay the same for all the free motion embroidery, but go back to default for sewing the pieces together. Practice having stitch length consistency. My machine has a speed adjustment. I picked a medium speed that I was comfortable using and created consistent stitch length. 5) Start in the circle middle. 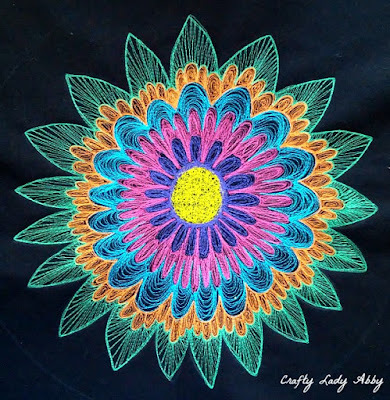 Unlike normal stitching along curves, you don't turn the fabric for free motion embroidery. You move it around, as if the needle is a pencil that you're drawing with. 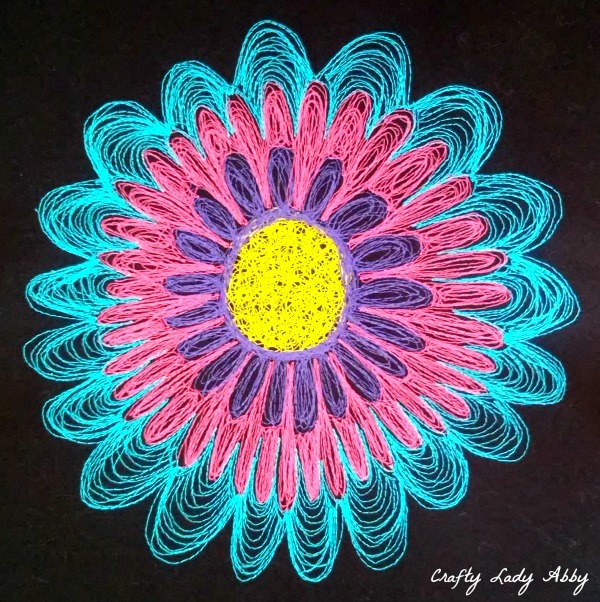 Stitch in looping circles, working out until you're satisfied with the width and density. You can overlap the stitches, to created a denser yellow circle. The edges don't need to be perfect. 6) Switch to purple thread. Using the white pencil, draw the petals if desired. I didn't draw them 1st, for this round. 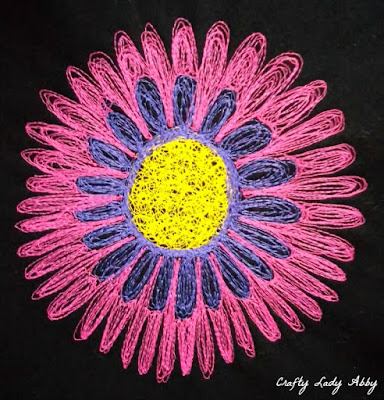 Stitch around the yellow edge, multiple times, creating a purple circle. 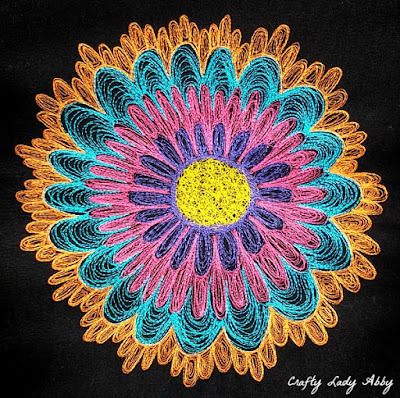 Created petals by looping the stitching in tear drop shapes. 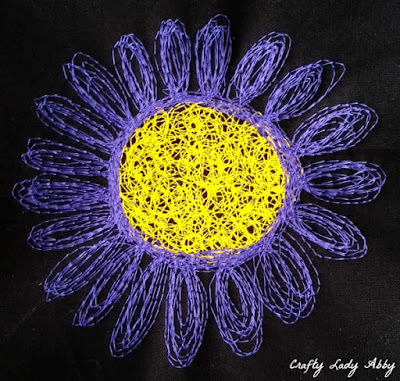 The multiple passes, give the stitching a sketching appearance. This is what you want. This isn't about perfection, but layers. 7) Switch to pink thread. Using the white pencil, draw the petals if desired. I didn't draw them 1st, for this round. Add petals between and above the purple petals. These are the same shape as the previous row. Outline all the petals. Then, start filling them in. This round is more dense, due to having more petals. 8) Switch to turquoise thread. Using the white pencil, draw the petals if desired. I did draw the petals this time, because they were much larger than previous rounds. 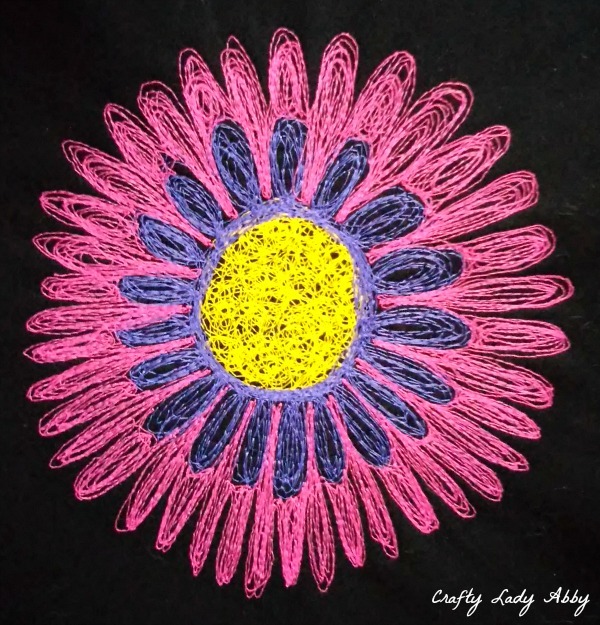 For these petals, I made the stitching arch in layers, like a rainbow. Outline all the petals. Then, start filling them in. 9) Switch to bright orange thread. Using the white pencil, draw the petals, as these are more intricate than previous rounds. Outline all the petals, along the drawn lines. Stitch along the turquoise petals, making multiple passes. Then, start filling the petals in. The fill for these is in a spiral. 10) The last row is leaves. Switch to mint green thread. Using the white pencil, draw the leaves. Stitch along the drawn leaves and previous petals, in several passes. To fill, make zig zags, mimicking real leaves. 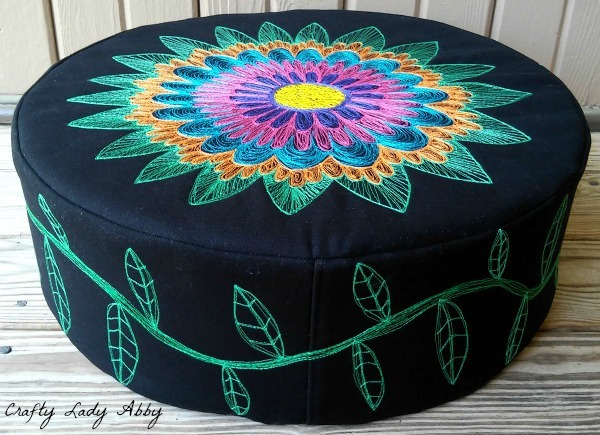 Set this finished embroidery aside with the pouf bottom piece. 11) The circumference of the foam tuffet is 56.5" but we need a little extra for seam allowance and overlap. From the canvas and interfacing, using the ruler and white pencil, create 2 rectangles each, 7" wide by at least 30" long...longer is fine. Cut the rectangles out. Fuse the rectangle interfacing to the canvas, as done with the squares. Trim away any excess interfacing. 12) Put the canvas rectangles canvas sides together. At the sewing machine, Straight stitch two short sides together. Open the pieces, and hand press the seam to one side. Top stitch 1/8" from the seam. 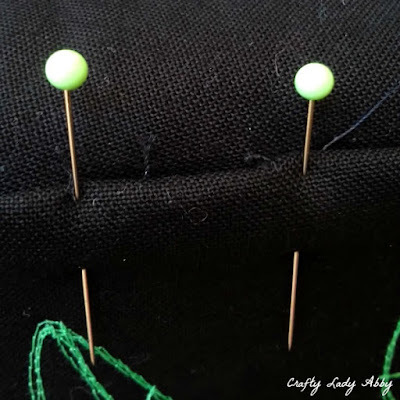 Switch back to the normal sewing machine foot, if you aren't comfortable doing this step with the free motion embroidery foot. Now you'll have one long strip. 13) You could draw this part, or do like I did, make up the design as you go along. Load the sewing machine with green thread. Working in small sections, stitch a curving vine, going over the design in multiple passes. Continue stitching the vine in sections, from one end to the other. When you are done with the vine, switch to mint green thread. 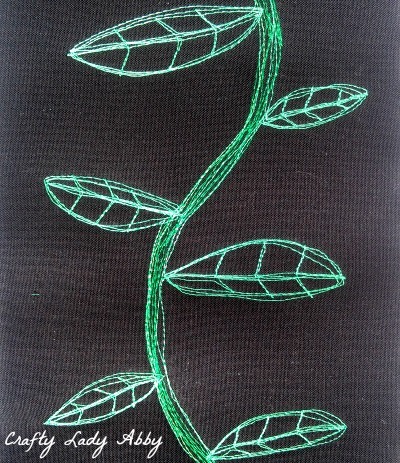 Stitch along one vine side, stopping every few inches to create a leaf. 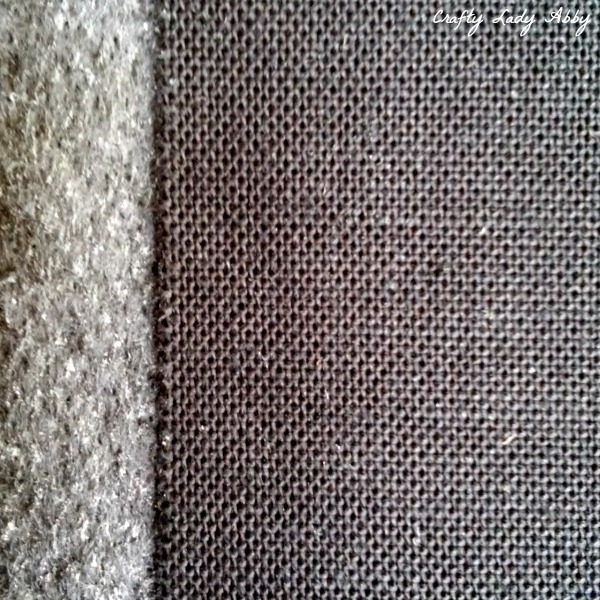 Keep the leaves about 1/2"-1" away from the canvas edge, accounting for seam allowance. 14) Back to the squares. 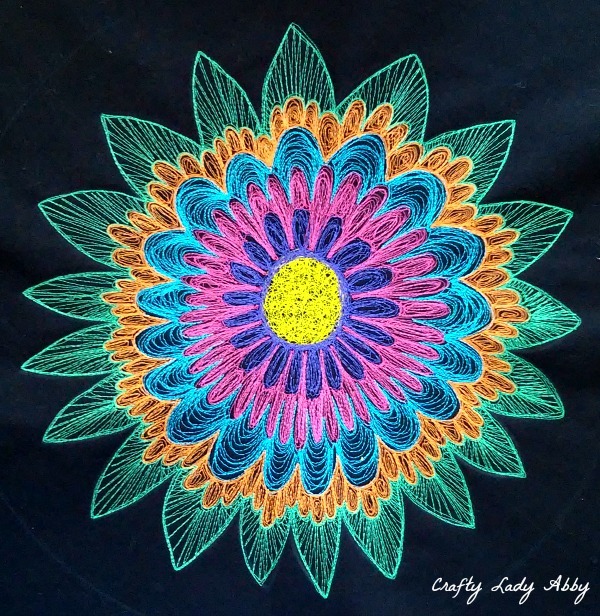 With the white pencil, draw a circle 1/2" around the previous circle, on the embroidered square. This adds seam allowance. Cut along that new bigger circle. Trace the new circle onto the 2nd square, for the backing circle. 15) Switch back to the normal sewing machine foot. Switch to black thread. Place the top circle and side rectangle, right sides facing. Fold the rectangle short end back 1". Stitch the two pieces together 1/2" from the edge, following the circle shape. Stop when you reach the beginning. 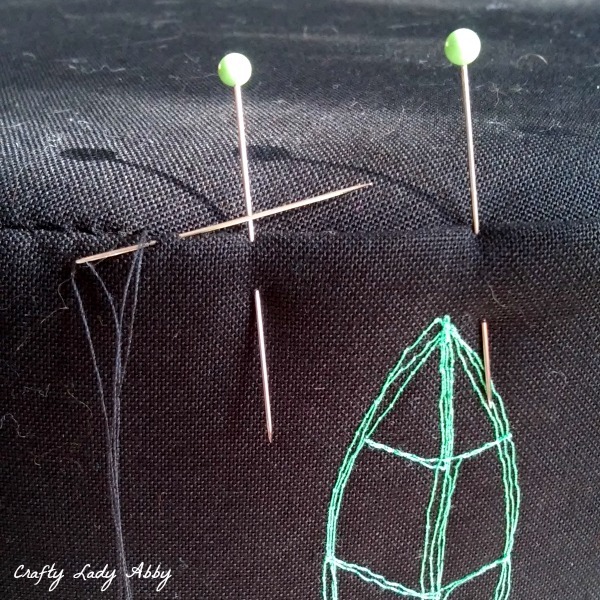 With the scissors, clip the curved edge every 1/2", making sure not to cut the thread. Turn the pieces right side out, shaping the circle. 16) At the ironing board, press the seam, so the edges, are towards the sides. Press This looks better later. Also, press the other long edge in 1/2" for easier hand sewing later. This is hindsight, that I wish I'd figured out before sewing this thing together. Hey, I'm making this easier for YOU...not me. 17) Stuff the foam tuffet into the case. Lay the bottom piece onto the exposed tuffet. Pull the sides up, to overlap the circle edge. Using straight pins, secure the seam in place. 18) Thread a hand sewing needle with black thread. Match up the ends and double knot them. 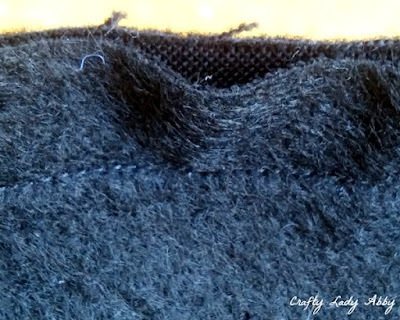 Stitch the bottom seam using an invisible stitch. If you're not awesome at an invisible stitch, don't fret. This is the BOTTOM. A normal person isn't going to inspect it for perfection. The top and the sides are good distractions from any wonky hand sewing. Here's a good video tutorial if you need some instructions. Visuals are great for this tricky stitch. If you're running low on thread, knot it off, and clip the excess. Repeat rethreading your needle as needed. 19) When you get back to the side seam, fold in the excess fabric for the side panel about 2" under the beginning fold. Cut off any excess fabric beyond that 2". Straight pin this seam closed. Hand sew it shut with invisible stitches. Unfortunately, my vine doesn't match up on that side, but it looks swell on that machine sewed seam! If you were to plan better, you might be able to measure closer to accurate and match up the vine. 20) If there are any pencil lines left, using a damp towel to remove them. That's all for this tutorial. You can change up the colors to better fit your decor. I'll definitely be revisiting free motion embroidery in the future, as I enjoy using it to make my artwork more textural. 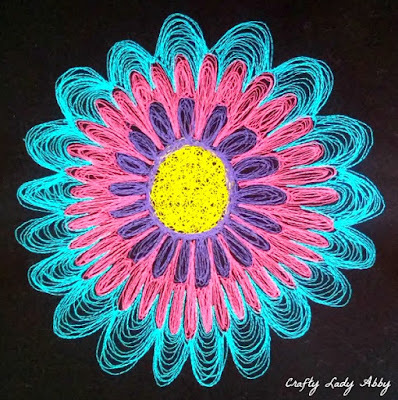 If this seems too intricate for you, create a simpler design with less rounds and detail. This idea would also be great for a pillow, of which Fairfield World has many different pillow inserts. Whatever you decide to make, have fun with it! Happy Makery.